Are you trying to figure out what your target market is for your art? Many struggle with this but don’t realize they have a collection until they look back over the old paintings. Whatever your experience is in life is great content for your artwork because you’ve lived it. 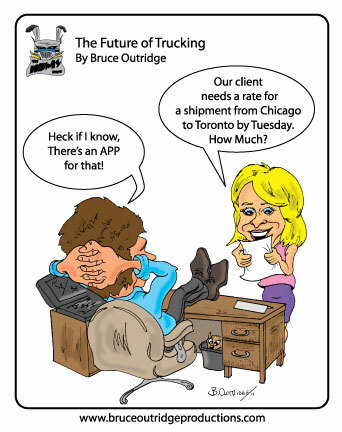 Most of my work is on the transportation industry because that is what I did before becoming a full time cartoonist. So while I may not be known in the New York Times, I am well known in the transportation industry here in Canada. Most of your painting will come from your experience. Even if you paint landscapes there probably is a certain landscape that appeals to you more than another so that is what you should focus on. The secret to success in the arts isn’t to copy what others are doing but to create your own style and artistic property that is unique to you. Once you have decided on your subject matter and a body of work you can start directing that towards the people that would be interested in that type of art or subject matter. If you focus your art, you’ll focus on your target! Previous Post Previous post:Do I Need Electronics to be an Artist? Next Post Looking for Ideas for Your Art, Get Out of the House?